Read more about Ikea Hacking. Staining The Frames. 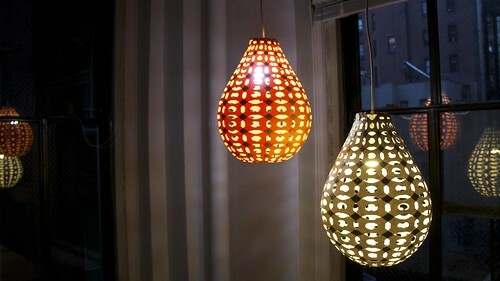 Here are the editor's picks of the lighting projects funded on kickstarter.com. Can't wait to see these lamps mass-produced. Blime is a DIY Parametric light fixture that can be assembled at home and shipped flat. Because its design is parametric and fabricated with a laser cutter, Blime can be easily customizable. So I was looking for cheap magazine racks and came upon this set of two at Ikea. As they came unfinished I decided to give them a new look to match my desk. Used oil-based Minwax® Wood Finish™ in English Chestnut 233 for outside and Early American 230 for inside. You can't really see the difference between those two, but anyways. Here are our editor's picks for the home office ideas on Behance. This writing/drafting desk was designed with simplicity in mind. Built out of castoff wood scraps and recycled material, this desk combines minimalistic qualities with an abandoned shipwreck sort of feel. Here are our editor's picks for the Top 10 Furniture Design on Behance. convertible clearance for the small but important things in life. I used PolyShades in a recent armchair renovation project. It is a stain and polyurethane one-step product. My baby suffered long-term outside exposure, so I believe the original dark lacquer turned into an even darker shade. What I needed to do was to lighten up the wood and create an antique look. Class, comfort, and elegance are the three words that describe the role of furniture in your life. Your choice of furniture defines aspects of your life ranging from tastes and character. The power of furniture to describe your interior and exterior spaces illustrates its value as considered within the home environment or your office space. Usually, the design, color, and size of furniture play the most valuable role in enhancing the ambiance of your living room, bedroom, balcony, or verandah.